Beautiful, sweet, smiling Emmaculate is a student at Tania Integrated Centre. She was brought here by her father after their family had fallen apart and he realized he could not meet all her needs. He felt here, at Tania Centre, his daughter would be well looked after both physically and emotionally and she would be given a chance for a better future. Emmaculate is a hard working student who always rates high in her class. 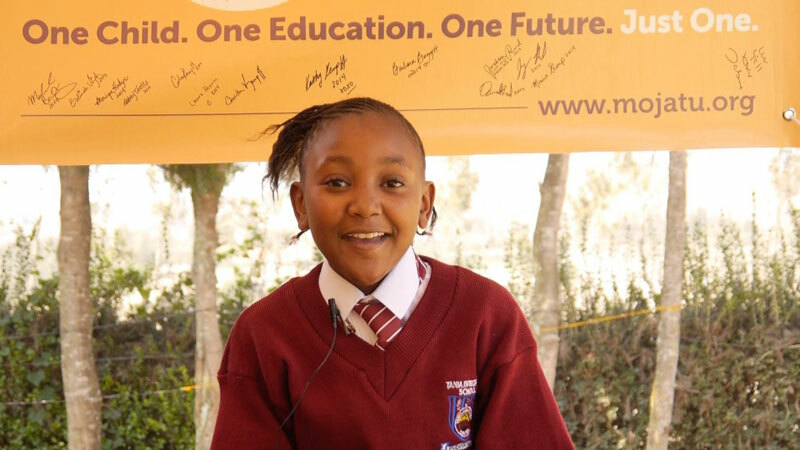 In November, 2014, she sat for her Kenya Certificate of Primary Education examinations (KCPE) and is looking forward to getting good grades that will get her accepted into a good secondary school. Through the continued sponsorship from Moja Tu she knows that she’ll be given the chance to continue her education, and hopefully achieve her dream of becoming a journalist. She says “I see the beautiful ladies on Television and I imagine myself being one when I grow up.” She is encouraged to see other children with more problems than herself at the Centre and always hope to be a successful person in future so that she can give back to other needy persons. Moja Tu sponsorship to Emmaculate has not only given her the hope that her education will be continuous, it has shown her love, the realization that she is important to somebody, and the comfort that somebody actually cares of her wellbeing. Aside from her studies, she is a member of the school dancing team and she keeps mastering various dance moves, and is also learning to play the keyboard. She loves combining singing and with dancing and whenever there is an event at her school, she always asks for a chance to present a song. Her teachers encourage her to perform as it helps this confident yet shy young lady become the great person she hopes to be. This however is hidden by her cute smile! We hope her star will keep shining till she becomes. She is very grateful to Moja Tu for sponsoring her and she realizes the rare gift she has been given. We hope her star will keep shining as she grows into the great person she and we know she will become.